We are now in the 4th week of Ted Seth Jacobs' drawing workshop at BACAA. This week we started drawing a 3-week pose. Today is the 4th day, and I spent the first 3 1/2 days struggling with the block-in. I don't know what it is, something about the leaning tilt, but it is an incredibly difficult gesture to capture. I erased and started again a half-dozen times. But practicing a block-in is a good exercise, so the time was well spent although I don't have much to show for it. This is an interesting stage of the drawing, because you can see the earliest marks of my block-in, especially at the feet, as well as the more polished part by the shoulders. While I draw I repeat in my head over and over "rounding and ending", which I described here. The practice of thinking about the three-dimensionality of each protrusion is a a new technique for me. Also, being conscious about which sides of a shadow are soft, and which sides are crisp is really helpful. Repeating "rounding and ending, rounding and ending" helps me remember. 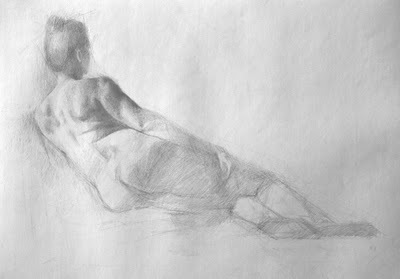 I have also been thinking a lot about how to paint and draw nudes, especially female nudes, without relying on a traditional idea of beauty as a hook. I think about how to depict an individual without reducing her to an idea of a woman. There is so much history to contend with, it's hard to resist. The temptation is to emphasize her beauty. Especially because this model is tall and slim and attractive, and especially because she has been arranged in a classical pose. My goal is to try to depict her as a real, breathing human being. Let's see how I do. Sadie, I've been following your work and progress for about a month now, and I've got to say that your work is simply beautiful. I hope you don't mind, but I'm "tagging" you. I don't know if you're familiar with this in the blog world (I was just introduced to it). but you're supposed to list 5 things about yourself on your blog , and then "tag" 5 other bloggers. I'm sorry if this is annoying - please ignore it if you like. I saw it as a potentially positive thing for more exposure. Anyway, again, your work is great!